Create your unique piece of wood jewelry with Nympheart! I love art. Looking at what someone else created so passionately and creatively inspires me. I enjoy giving an art piece my own interpretation, turning it into my own story. For me fashion is art too and I love it for the same reasons. When interviewing designers for my blog, I feel inspired by their passion. And I love to give their pieces my own twist. Whether you’re into art too, or just appreciate an original creation, you’ll love the brand I’ll introduce you to today! 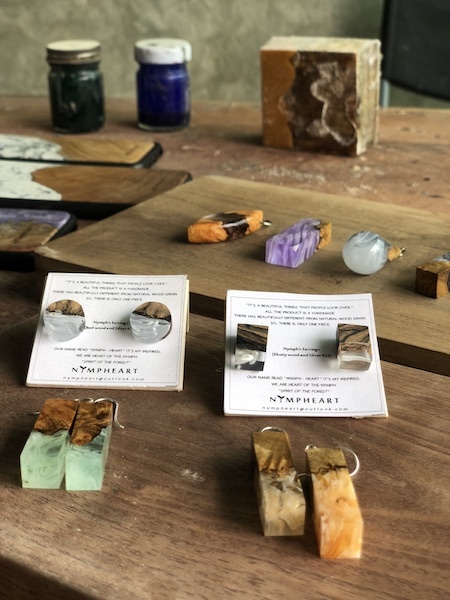 Meet Nympheart, a Thai jewelry brand combining art, architecture and fashion. The creative minds behind it are Pleankan Traiknhumpun – who (luckily) goes by nickname Momo – and Teerapol Tanamontol, or Palm in short. 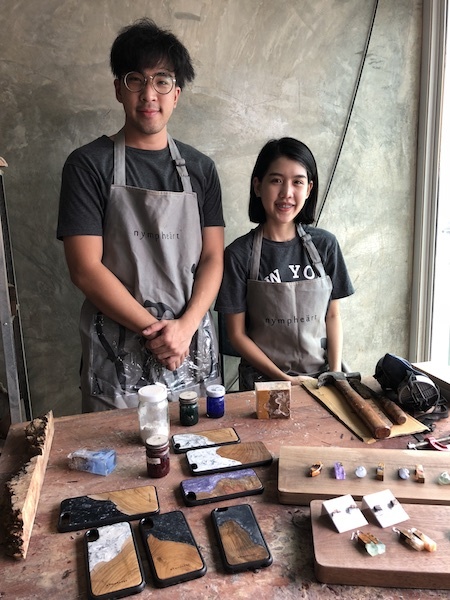 This cute Thai couple graduated in architecture and furniture craft, but started experimenting with art and jewelry design as well. They couldn’t pick one passion but instead mixed it all up, giving Nympheart its unique style. I was allowed to take a peak behind the scenes and see how they create each Nympheart piece by hand! 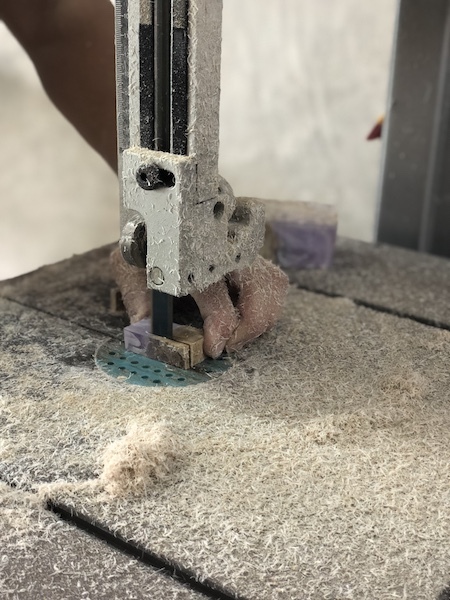 Momo and Palm only use reclaimed or salvaged wood, which has already served a purpose in another life. 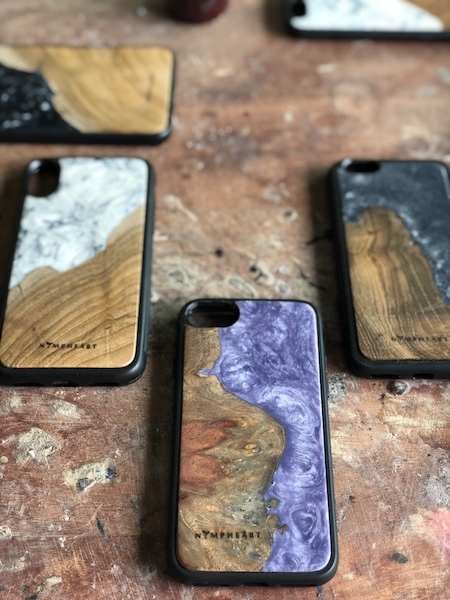 It makes Nympheart not only an original, but also an environment-friendly brand. They use teak and burl wood as a basis. 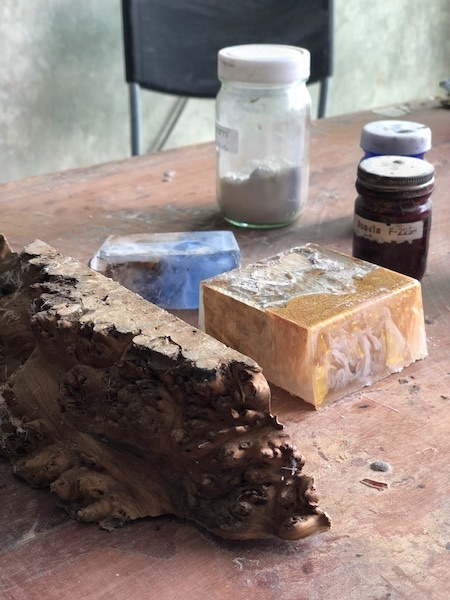 This choice is not a coincidence – Thai people believe these kinds of wood bring luck! 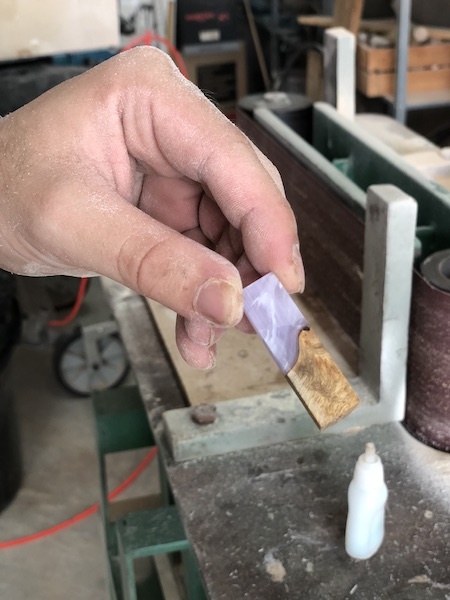 The colored part is made from epoxy resin, which is a type of rubber wood like amber. It’s inserted into the natural gaps and cracks of the teak and burl wood. As each item is made by hand, you can customize it. 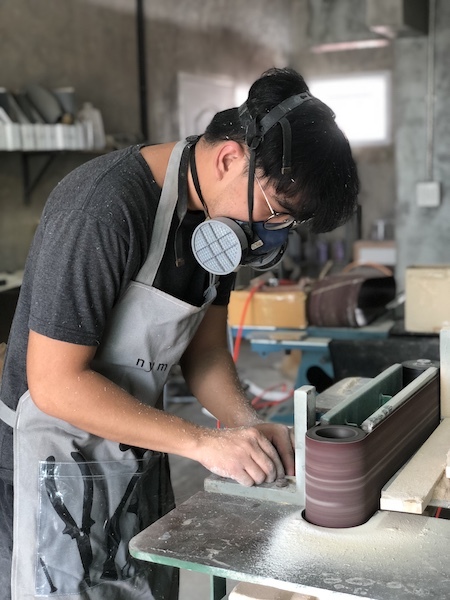 Tell Momo and Palm which stone, wood type, and shape you’d like and they’ll be happy to craft your unique piece for you! One of my favorite pieces (though it’s almost impossible to pick!) is this necklace from burl wood in the form of a water drop. It’s like carrying the sea with you! The price of each piece depends on the design and type of wood you pick. This ring would cost approximately 1000 THB and the necklace 900 THB. The earrings of this collection (see picture on top) are 400 THB. Get in touch with me if you’d like more details! Momo and Palm’s original brand name was one of the first things that sparked my attention. How did they pick ‘Nympheart’? I can guarantee they stole mine already! You can have a look at the full collection on Instagram @Nympheart. If you live in Thailand, you can order by sending them a message on Instagram or LINE @Nympheart. If you live abroad, you can contact either Nympheart or me to have your item shipped internationally. Love their art! It’s so beautiful and inspiring! Hi Gabriela, happy to hear you like it too! Looking forward to sharing more beautiful local Thai brands with you! I truly enjoy studying on this internet site, it holds superb content. Happy to hear, thank you for dropping by here!